We think of robotic technology as something used to advance mankind, but this example of the first ever cruise missiles may make students think twice. Who were all the players in the second world war? Which countries comprised the Allies? Who were they fighting against? Have your students fill in a world map by color for the sides and indicate the month and year each country got involved to give them a visual of the extent of this war which affected the planet. While I might be inclined to reserve this for high school students and beyond, this Minute invites an investigation of the strategy involved in WWII. This article - for more mature students - details exactly how the “doodlebug” technology changed and, in all probability, lengthened the course of the war. 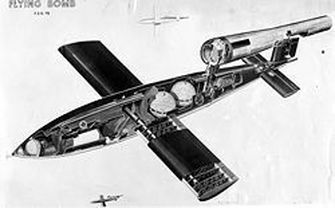 Explore war strategies using the V-1 bomber as a case study. How exactly does a jet engine work? Check out this video with your students (which mentions the doodlebug) to help your students understand the science and history behind the jet engine.